The best of both worlds; a heavy-duty umbrella is extra-easy to move. The Monaco Cast Aluminum Umbrella Base with Wheels and Handle by Treasure Garden is one hundred pounds of convenience. Not only do you get an umbrella base that is capable of holding over-sized umbrellas in place, you get 2 wheels and a built-in handle. This ingenious design allows you to tip the base and move it effortlessly around your patio, enabling you to move your shade as you like. For commercial applications, the concept is a no-brainer. If you like the idea but want an even heavier base, there is an optional 30 pound add-on weight, as well as an optional stem for 2” poles. Constructed from premium materials, the Monaco has a cast iron base with a cast aluminum shell for long-wear. 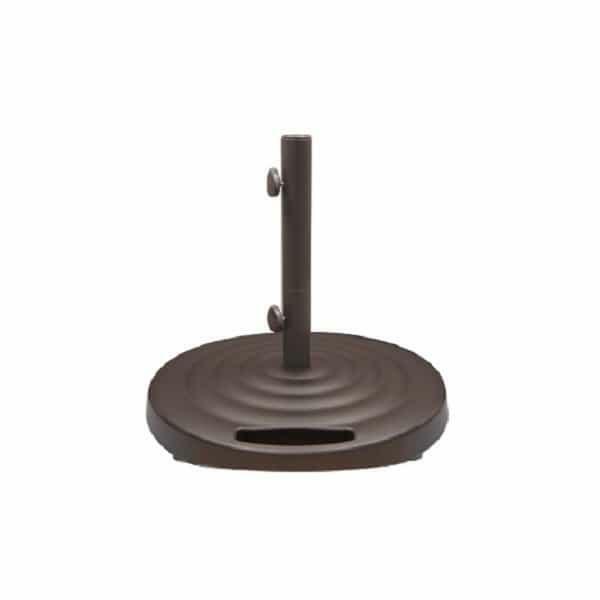 The Monaco Cast Aluminum Umbrella Base with Wheels and Handle is available in your choice of three finishes: bronze, silver or black.